Most companies continue to report as usual on minerals in their supply chains that come from war-torn parts of Africa, despite concerns that reduced regulatory scrutiny would trigger scaled-back disclosures. 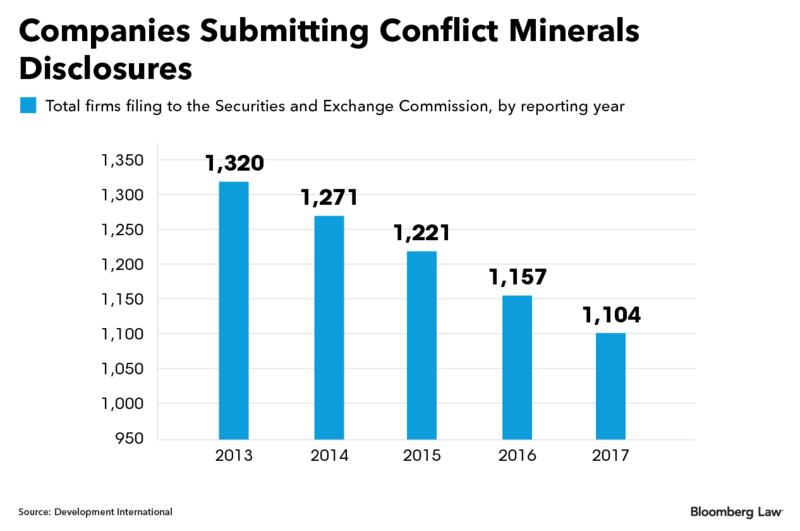 About 1,100 companies have submitted to the Securities and Exchange Commission reports on their sourcing of these conflict minerals, according to an annual tally by the nonprofit Development International. Staples Inc. and Adobe Systems Inc. are among only about 70 companies that filed reports in the past and didn’t file anything for 2017, the most recent reporting year. Chris Bayer, principal investigator for Development International, worried that the number of conflict mineral filings, due May 31, would fall after the commission relaxed its stance last year toward enforcing some aspects of the reporting requirement, put in place by the 2010 Dodd-Frank law. The SEC is reviewing its rule in light of a court decision that struck down part of it amid pushback from the National Association of Manufacturers and other industry groups. These groups didn’t want companies to be forced to say whether or not minerals in their mobile phones, jewelry, and other products have been linked to conflict and human-rights abuses in the Democratic Republic of Congo (DRC) and neighboring countries. The filings count falls slightly each year, and this year’s reduction is on par with past years’ declines. It’s driven partly by companies such as Staples that go private and are no longer subject to the SEC’s disclosure rule for publicly traded firms. Mergers and acquisitions also play a role. Some companies that filed conflict minerals reports in previous years, including Adobe, Autodesk Inc., and Overstock.com Inc., didn’t submit anything this year because they stopped making or contracting products that contain at least one of the four conflict minerals: tin, tantalum, tungsten, and gold. Companies that use any of these minerals in their products must report to the SEC on whether they come from the DRC region. Other companies that filed reports previously, such as Valeant Pharmaceuticals International Inc., are late in their reporting this year. “I don’t think there’s anything nefarious going on,” said Michael Littenberg, a partner at law firm Ropes & Gray LLP who advises companies on complying with the SEC’s conflict minerals rule. He said he didn’t expect a reduction in filings following the commission’s April 2017 statement on enforcement, made by then-acting Chairman Michael Piwowar, a critic of the SEC’s reporting rule. Piwowar’s statement might have encouraged companies to scale back their disclosures. But “very few” did that last year, Littenberg told Bloomberg Law. Barnes & Noble Inc. and The Southern Co. were among about a dozen companies that opted not to provide detailed disclosures on their supply chains, according to a group of investors managing a collective $1.2 trillion. That’s the piece of the SEC’s reporting requirement that Piwowar said would be “difficult” to enforce. “We regret that there has been some uncertainty about the status and necessity of the reporting requirements,” the investors said May 31 in an open letter urging companies to continue providing “complete and thorough” reports. The letter was signed by Aviva Investors, Trillium Asset Management, and other faith-based and socially conscious investors. Most companies “don’t see a lot of upside to scaling back their disclosure” because they’ve already done the supply chain work that goes into reporting, now in its fifth year, Littenberg said. Companies may also be motivated by public ratings and rankings by groups such as the Enough Project, he said. The human-rights group’s most recent ranking showed that Apple Inc. and other consumer electronics companies are generally further along in efforts to clean up their mineral supply chains than jewelry retailers, which are among the world’s largest end-users of gold. Apple topped the ranking, scoring highly on a measure that shows it can trace its supply chain to a key chokepoint where minerals are processed before they’re used in products.